The time distance perspective shows a very different picture of the digital divide than static measures. Both perspectives are necessary and S-time-distance as a novel generic statistical measure is needed to make the present-state-of-the-art more relevant for multi-dimensional and long-term development analysis and policy debate. Pavle Sicherl contributed a brief note to the open discussion for the Paradiso 7FP project ‘ICT for a global sustainable future’ available below. The broader orientation beyond GDP means that comparisons and policy debate have to be broadened in two respects: 1) with new values and new Beyond GDP indexes or indicators and 2) with new statistical measures that can help the stakeholders to build their perceptions of the situation in a broader dynamic framework that is closer to the reality. In such a broader framework beyond the static measures (like Gini coefficients, indexes or percentage disparities) a complementary but very different picture of the importance of the ICT in world development is obtained. The dynamics of the ICT access might be considered as important means to reduce disparities in the world, at least in this domain. 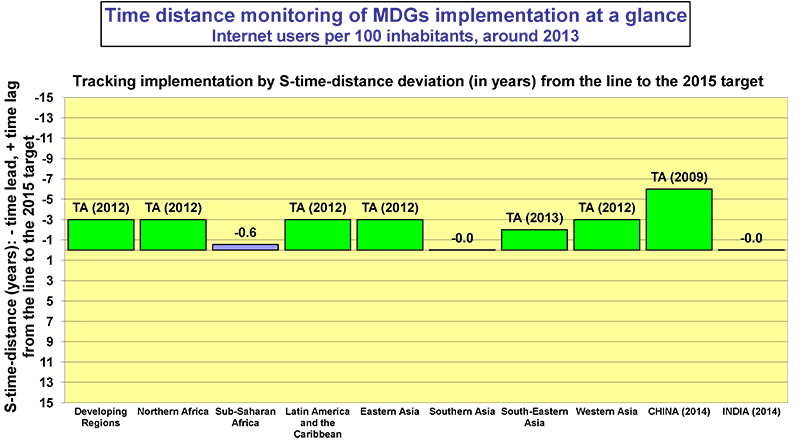 The time distance gaps for ICT access are much smaller than for GDP per capita or life expectancy. The time distance perspective of world disparities was studied by calculating S-time-distances of how many years earlier were the present values for 160-190 countries attained in Sweden as a long-term benchmark. Median S-time-distance lags behind Sweden for GDP per capita was in 2003 70 years and for female life expectancy 53 years (meaning that for half of the countries the time lag was more than that). The median values of S-time-distance lag behind Sweden for internet users per 100 inhabitants were in 2006 about 10 years and for cellular subscribers per 100 inhabitants about 7 years, even though the static disparities are high.